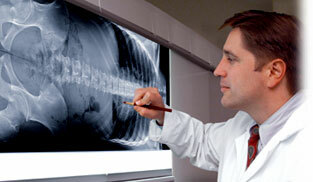 Codonics Horizon® XL Multi-media Dry Imager provides the only means of printing long film in today's digital age of CR/DR, printing digitally stitched 'true-size' images on one continuous film. 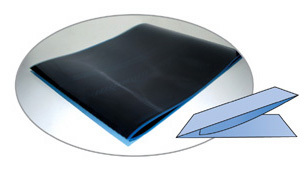 Available in two sizes, our 14" x 36" and 14" x 51" long film folds to 14" x 17" to fit conveniently in a standard film jacket. In addition to long film, the XL prints on several other sizes of film, plus 14" x 17", A/A4 low-cost grayscale paper and A/A4 color paper. 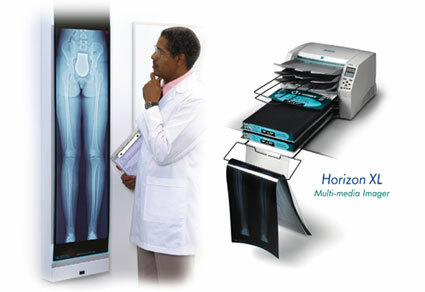 A total solution for all of your orthopaedic radiology needs, Horizon XL weighs less than 70 pounds and takes only two feet of counter space. 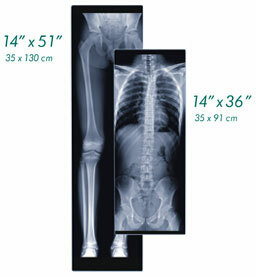 Using long film for true-size imaging, 14" x 17" and 8" x 10" size film for extremity MR, low-cost grayscale paper for surgical planning, referral copy and patient files, and color for arthroscopy and 3D color CT, Horizon XL covers all your orthopaedic print needs in one compact device. standard 14" x 17" film jacket.